Visit the Sultans of Science exhibition at Petrosains and snap a photo of yourself within the area. Submit as many photos at Sultan of Science FB apps and invite your friends to vote for you. Each month from January to March, the participant with the highest number of votes will be the monthly winner. The top three participants with the most votes from each month will be invited to participate in the Sultans and I Photo Contest Grand Final. Visit Sultan of Science FB apps for more details. 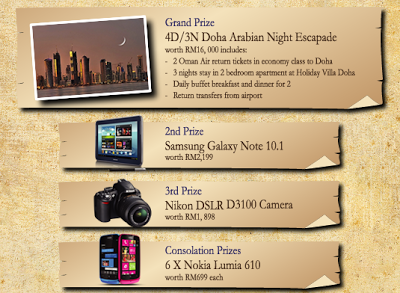 Join & win iPad mini & RM500 Ikea voucher!